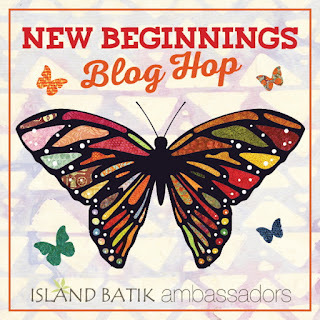 Island Batik asked their Ambassadors to interpret the New Beginnings theme in any way they desired. The name of the January Blog Hop evokes so many ideas. I had the privilege to use Island Batik's Coastal Mist Collection. These misty sea colors were perfect for interpreting the the theme with a New Beginnings Baby Bag for that precious new beginning. Every new parent needs all the storage they can get. The pieced chevron panel was fun to make and creates four pockets on the outside of the bag by the placement of the comfortable handles. The inside of the bag sports another pocket and plenty of room to carry all those baby necessities. To win a sampling of Island Batik Fabric, subscribe to Stone Cottage Designs-Quilt Blog AND leave comment. (Drawing for fabric sample will be at the end of January) Already a subscriber? Just leave a comment. If you want to enter to win some Island Batik fabric from Island Batik go to their blog HERE and enter using the Rafflecopter. Posted in Island Batik, Island Batik New Beginnings on January 9, 2017 by Barbara. The Coastal Mist collection contains a beautiful array of colors! It's perfect for a carry-all bag for a new mom or dad. I am a new Bloglovin' subscriber and would love to create with this collection. Yes Coastal Mist is a lovely collection. I held back a few of the pieces in the collection to use in the accompanying quilt! What a perfect gift for a family with a new baby, love the batiks you used. Connie, I usually go for wild and bright, but Island Batik's Coastal Mist, just said Baby Bag to me! Another awesome blog hop! And such beautiful colors!! Lori, those where my thoughts exactly! Not to girlish, not boyish- more mom-ish colors, and soothing. That is great and would be appreciated by a new parent. Mary, I think it would too. I really like the way the handles go into the body of the bag, creating greater strength and stability. While I don't usually spend my quilting time on totes, this will be one I will plan to make. It will make the perfect "project" bag to carry both quilting work and genealogy research binders, so I will need to make at least two. The Island Batiks set the pattern off beautifully. Constance, I agree, it would make a great project bag! Beautiful fabric and great bag. I'm already a subscriber. I'm a new subscriber and I love this bag! It would be great as a carry on while traveling. Cecilia, I tink it would make a great bag for traveling. Now I need to make a couple more! The bag is so gorgeous and I love the fabrics. This would be a wonderful bag to carry all my "treasures" in. I am a new subscriber. I loved how many pockets it created for all of those treasures. Anna I will try to get it finished, edited and ready, very soon! Coastal Mist colors are very pretty!! Jody, they remind me of a calm quiet morning on the beach. Great looking bag Barbara. I may not have a baby either in my near future (and hopefully not in my grandchildren's futures for a few more years yet), but I can envision a lot of other great uses for a bag with room and extra pocket space. Nancy, it was mentioned earlier that it would make a great quilt project tote. I agree; lots of pockets for tools. What a great bag for a new mom! Love the batiks! Your bag is just beautiful! I love it. I'm subscribed to your blog. Ariane, Thank you so much! Karen, I am working on the pattern- hopefully it will be ready very soon. I loved how the bag turned out. It grew 'organically', it is great when a plan comes to a good fruition. Really cute baby bag. I am a new subscriber to your blog. Thanks for the giveaway. Love the colors and combination of colors! What a lovely bag. I like the colors of the collection. Love the bag as does not have to be for new parents. having all those pockets is very handy. Love this new batik line as it reminds me of the pacific northwest which is where I live. I'm a new subscriber. Laura, yes they are truly indicative of a Coastal Mist. I'm already a happy subscriber! Those batiks are beautiful and I love your bag. Good job! Thanks Terri. They are beautiful batiks. What a great way to interpret "New Beginnings!" Your baby bag is beautiful! Thanks so much for sharing it. I really like the design of this baby bag. The colors of the batiks fit this project perfectly. Thanks Jessica, Coastal Mist is a soft and calm collection! A real change from my usual bright and wild color choices. It is amazing what a 'change of pace' can bring about! I love a bag with lots of pockets. Vicki, I also love a bag with lots of pockets. I am going to make myself 2 more, one for a quilt tote, it holds a great deal, couldn't believe it, and one for a general tote! I like the way the chevron panels are used for the pockets, and the fabric is so pretty! I just started following your blog with bloglovin. Thank you Maureen! First time for me making this type of chevron, but not the last! Hint: it is all one panel, the handles make the pockets! I love this bag and the beautiful fabrics. I signed up for yournewsletter. Very nice bag! Love the pockets, and the straps. I have signed up to subscribe by email. Nice bag...love all the pockets! Thanks Pam! I love the pockets too. Beautiful collection, like your blog. Thanks. What a perfect project for New Beginnings! The bag is wonderful and the fabrics are lovely! Beautifully done! What a great use of your fabrics and totally represents "new beginnings"
I needed a new bag! Perfectly, just for me. Absolutely Melody, it doesn't need to be a baby bag. LOL Beth! My diaper bags were from the 70's - hand made out of old denim jeans - so NOW who's dating herself. When I designed this bag, I did so with the future in mind! Baby's grow up, but this bag can be used for anything! PS I gladly subscribed via e-mail. Thanks Connie! How wonderful that you family is growing! New subscriber via Island Batik. Bag pattern looks wonderful - anxiously awaiting! Thanks Cathy B. The bag pattern is just about ready to go to the editor! Deb, the pattern is almost ready for the editor! I will let everyone know! Love your bag and I am a new subscriber. What a beautiful bag! And I have a great-nephew on the way, so thanks for the inspiration. New e-mail subscriber! Lovely bag and fabric! Thanks Rebecca And I hope your year is one of fabulous sewing as well! Coastal Mist is a gorgeous collection of color! I love the bag you made, it has so many possibilities. I am a new subscriber to your blog. Now to go browse. Perfect bag for a coworker. what a great bag. wish i had one of these for my babies (my baby is turning 3 soon), but looks like an awesome bag for lots of things! i'm a new subscriber! i love IB! Thanks Rachell! Parents of 3 year olds still carry a lot of stuff around. My first grandchild arrived on the 12 January - this would be just right for him! Congratulations Jayne on the birth of your grandson! This is very pretty, perfect gift. I need a bag like that!!! Love it... especially those batiks!! Thanks Michele! The pattern will be available soon! Gorgeous batiks & your bag would be great carrying things to quilting Bee! Janine, I think so too!